Let’s be honest. You came to Osaka to eat. Ramen. Udon. Donburi. Japanese curry. Takoyaki (octopus dumpling). Yakiniku (grilled beef). There’s a reason Japan’s third-largest city is called the country’s kitchen. But there’s one particular dish about which you’ve been dreaming. You have to go to one of the city’s best restaurants to find it. The restaurant is Hajime. It has just seven tables, plus a private room, in its ultra-small dining room. Its chef, Hajime Yoneda, was an electronics designer before putting himself through cooking school and learning from acclaimed French chefs. Its awards (three Michelin stars and #34 on Asia’s 50 Best Restaurants) are stacking up. 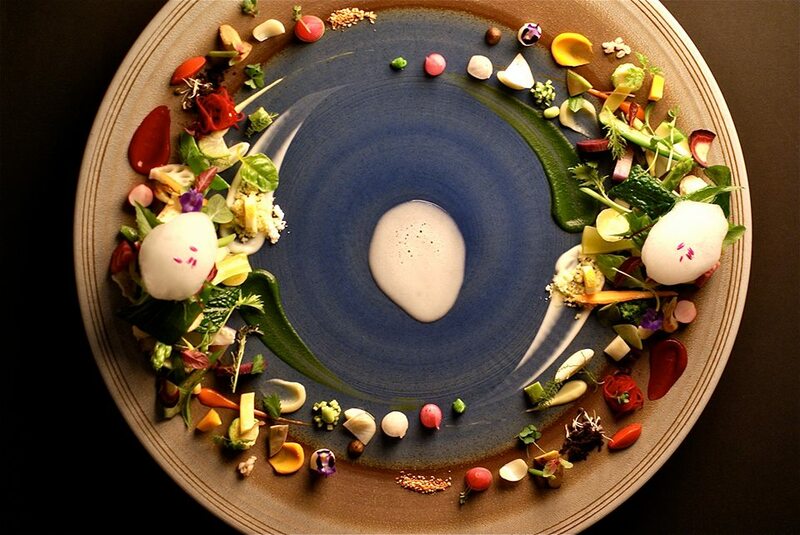 While its vegetable-forward menus truly look like pieces of art. The dish is chikyu. Its name means planet earth. It represents the cycle of life with plants enriching the land and ultimately flowing into the sea. It’s composed of 110 different grains, herbs, and vegetables arranged around a shellfish foam. It’s paired with a fruity Riesling from Alsace. Plus it’s Hajime’s signature dish. Chikyu is about the fifth dish on the 17-dish standard tasting menu. Mori (a forest mushroom consommé), seimei (life shown through ayu, flatfish, and herring roe), iso (an oyster dressed with cucumber, yogurt, and sea urchin representing the rocky coast), and kawa (Shinshu salmon and salmon roe depicting the river) come first. They’re served with French wines, Japanese wines (which you didn’t even know existed), and sake. Nodoguro (blackthroat seaperch), a freshwater prawn, duck with root vegetables, and lamb with dark fruits will follow. At least four desserts will, too. Even though the dishes are small, you’re completely stuffed by the time ai, a strawberry and raspberry sable, is set in front of you. Your first thought is to push the plate away. But then a warm sauce is poured into the center of the berry confection. It’s delicious. The chef and his team outdo themselves right to the very end. In doing so, they set quite a high bar for the rest of the city. It’s a good thing you set aside a couple of days to eat your way around Osaka.